Amanda Sullivan, a sophomore music therapy major at SPU, gave campers a chance to try making their own music at music therapy camp. A newly formed band gets behind their instruments at Seattle's EMP Museum and begins to rock. Shades on, drumsticks up, these kids are about to bring an '80s rock anthem to life. stars live with autism spectrum disorders and other disabilities. The museum's two-week music therapy camp this summer was the vision of Carlene Brown, associate professor of music and chair of the Music Department at Seattle Pacific University. The goal isn't entertainment, though that can be a byproduct. Instead, music therapy uses music to manage stress, alleviate pain, or enhance memory. Brown notes that former U.S. Senator Gabrielle Giffords, recovering from gunshot wounds, is using music therapy to relearn speech. 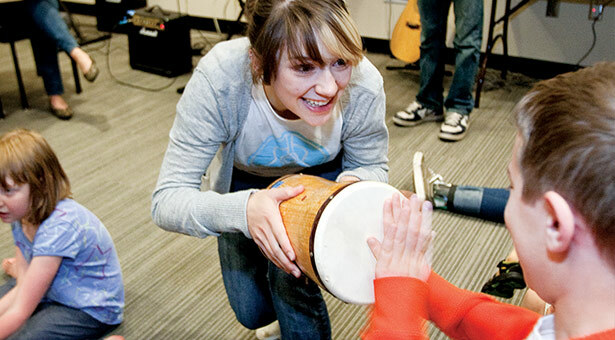 Cancer Research Center, giving music lessons to kids whose siblings were receiving therapy. While Brown built the music therapy program at SPU, Patricia Costa Kim, then education director at the EMP and a colleague of Brown's from graduate school, was seeking ways to reach out to people who are often left out of museum experiences. The two began developing the idea for a camp with exhibits retooled to meet the needs of kids who might otherwise be overwhelmed by the lights, noise, and general hubbub of the typical museum. Zook joined the project as a staff member. Kim died of a brain tumor last May, but Brown, Zook, and the EMP kept working to make the camp a reality. The staff trained extensively on how to work with the kids. They turned down the sound and developed walking routes through the museum designed to reduce sensory input. Brown recruited enough students and other volunteers to guarantee a 1:1 ratio of staff to campers. One of the trickier things, Cunningham recalls, was figuring out how to make the popular exhibit “On Stage” work. Visitors get to simulate the experience of playing before an arena filled with screaming fans, complete with light and sound. EMP could easily turn down the volume, he says, but the lights didn't work on dimmers. He came up with the solution of having the kids wear EMP sunglasses, which not only solved the light problem, but gave them a dose of rock star cred. “I think we all felt warm and fuzzy not just that it happened, but that it went really well,” says Cunningham. Some parents who only signed their children up for the first week returned for the second.